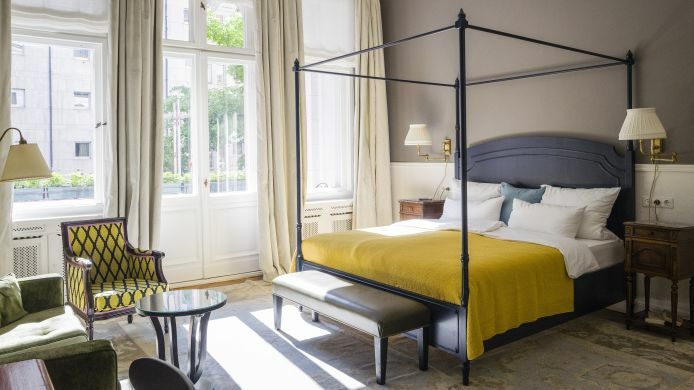 The “Henri Hotel Berlin Kürfürstendamm” offers a comfortable stay amid stylish Art Nouveau surroundings, featuring characteristic high ceilings and marble floors. Guests can enjoy breakfast in a refined salon and spend their evenings at the in-house bar, which is open until late and includes a separate smokers’ lounge. A business centre serves the needs of hardworking professionals with work commitments. Set in Berlin’s charming Charlottenburg district, Zoo Berlin and Kaiser-Wilhelm Memorial Church are both only a 10-minute stroll from the hotel, as is the Zoologischer Garten Train and Underground Station, making it easily accessible. Additionally, guests are only 500 metres from the famous musical and operetta venue, Theater des Westens. Sehr schönes und toll renoviertes altes Gebäude.